I, Torin Ailfred O’Patrick, Toppy for short now have a smile on my face and a sparkle in my eye. My mouth is a series of red Cross Stitches over one canvas intersection filled with white Continental stitches for my pearly whites. Great grin, n’est-ce pas? Also every get a hair in your mouth…obviously I have picked up a doggy hair. I know it will be removed now that everyone can see it. But it sure is annoying! I like my cheeks too; they are padded Gobelins with a darker pink floss. 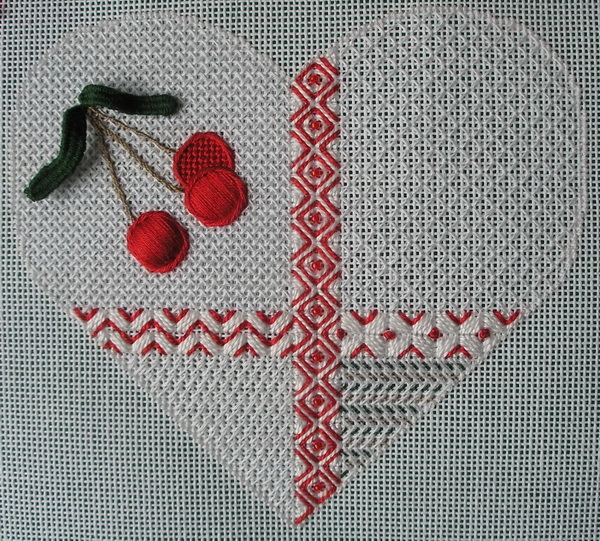 The padding is stitched first in Basketweave followed by horizontal Gobelins. I look like someone just pinched my cheeks. But my eyes say it all! Yes, I’m winking at you with my Gobelin stitched eyelid. I still need eyelashes but then I need a canvas full of hair too. 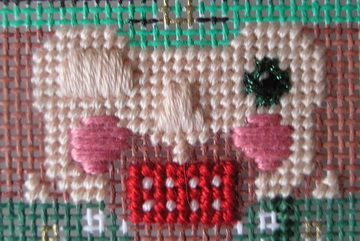 But my green eye is sparkling; four little Continental stitches in black and white surrounded by a Kreinik 008 green Jessica. 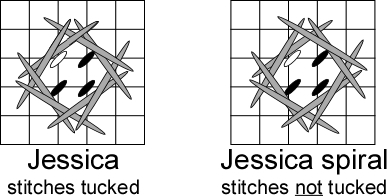 When stitching a Jessica don’t forget to tuck last stitches under previous stitches; otherwise would have a spiral eye and look like a pirate instead of the noble chief I am. This week-end I am getting at least a shirt coat and maybe pants…Aren’t you glad I’m a painted canvas, otherwise I might be x-rated. I loved the Olympics. It is one of my favorite things to watch even if the network tries to turn it into entertainment show. 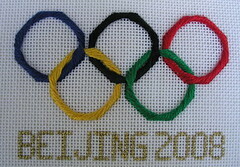 I usually try to stitch something related to the Olympics. 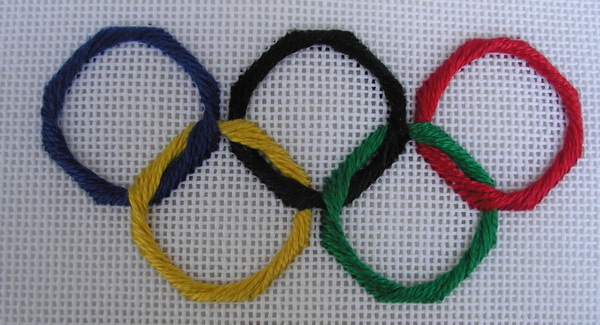 I love the intertwining of the rings…did you know that these colors represent the colors found in all the nations flags? 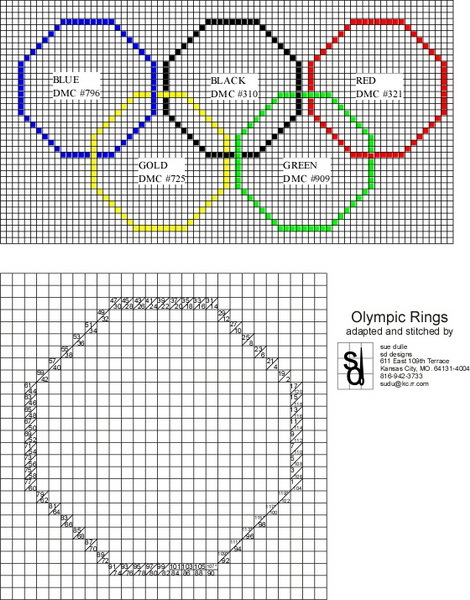 The first canvas of rings I ever stitched has a real Olympic connection. I had stitched the piece and it was just laying around looking for a reason to be finished when I a friend asked what I was going to do with it. I told her I wasn’t sure and she asked if she could have it. Her husband had been one of the coaches when Mark Spitz won all his gold medals and had some pins she had been wanting to frame for her husband and this would be a perfect accompaniment to the pins. Naturally I gave it to her and it did make a great picture. 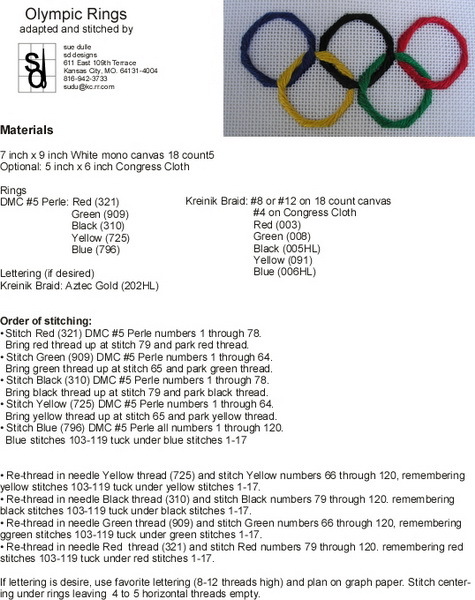 I have made ornaments for my Grandkids, box covers, and this year I have a friend who is living in China and her husband and one of their sons went to the Olympics this year.